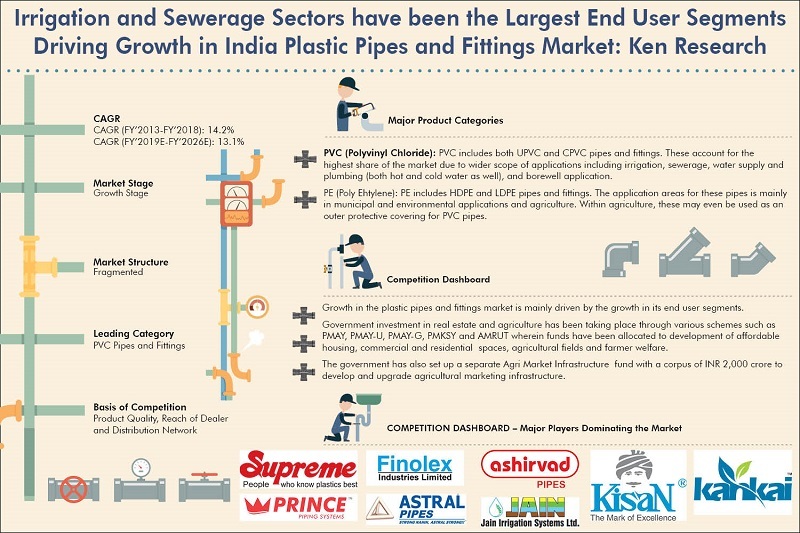 An increase in the focus of the government in India on providing affordable urban and rural housing with proper sanitation systems has driven the growth of the PVC pipes and fittings market in India. Analysts at Ken Research in their latest publication “India Plastic Pipes and Fittings Market Forecast to 2026 – By PVC Pipes (UPVC and CPVC Pipes), by Applications (Irrigation, Sewerage, Water Supply and Plumbing and Borewell Application), by Organized and Unorganized Sector and by Regions” believe that by expanding dealer and distributor network can help PVC pipes and fittings manufacturers to expand the reach of their products. Consistently tracking the construction projects being undertaken in India will also lead to greater revenue generation for these companies. The plastic pipes and fitting market is currently in its growth stage. The market started out in India in the 1960’s. The need for plastic pipes and fittings arose because the cement/concrete and metal pipes and fittings that were being used were too heavy and bulky. Metal pipes and fittings were also prone to rust and corrosion over time. At first, LDPE pipes and fittings were introduced, followed by PVC pipes and fittings. Over time, other plastic pipes and fittings of materials PP and PE were introduced. However, even today, the market for PVC pipes and fittings exceeds that of PP and PE by a large extent. Primary growth drivers for the Plastic pipes market are growth in real estate and agricultural sectors in India. With a rise in the population of the country combined with increasing personal disposable incomes of the people, the demand for housing has increased along with an increase in the standards of living. The Indian government has continued with and started new schemes under which it is investing in constructing residential units and improving the conditions of existing houses. Examples of such schemes are Pradhan Mantri Awas Yojana – Urban (PMAY-U) and Pradhan Mantri Awas Yojana – Gramin (PMAY-G). This has led to an increase in the number of housing units in both urban and rural areas. This has contributed to the growth in demand for PVC pipes and fittings because these products are used widely in water supply and plumbing systems in households. Increased reach of the AMRUT program (Atal Mission for Rejuvenation and Urban Transformation) which focuses specifically on development of cities has also led to rise in demand for PVC pipes and fittings. This is because the existing cement and metal pipes in sewer systems which have now become damaged and prone to leakage are slowly being replaced by PVC pipes. The perception of the consumers towards PVC pipes and fittings has slowly turned positive over the years and their application areas have increased to a large extent.